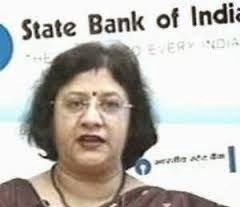 State Bank of India (SBI) on Monday got its first woman boss in its 207-year history, as Arundhati Bhattacharya took charge, after former boss Pratip Chaudhuri's tenure came to an end on September 30. Ms Bhattacharya, also holds the distinction of becoming the first woman managing director of SBI in August. Prior to this appointment, Ms Bhattacharya was managing director and chief executive of SBI Capital Markets, the merchant banking arm of SBI. Bhattacharya joined SBI as a probationary officer (PO) in 1977. During her 36-year tenure at the bank she has held a number of important positions, including those of deputy managing director and corporate development officer, chief general manager (Bangalore Circle) and chief general manager (New Businesses). She also headed SBI Capital Markets Ltd, a subsidiary of State Bank of India and had a stint in the Bank's New York office where she was in charge of monitoring branch performance, overseeing external audit and correspondent relations, SBI statement said.